Born and raised here in the Sacramento area, April works full time for the County of Sacramento and runs the "behind the scenes" operations of High Class Glass. She grew up playing softball and coached the sport at the High School level for 10 years prior to stepping away from that role in 2015. She also works as an Independent Consultant for an International Vegan Health, Wellness, and Beauty company called Arbonne. She is passionate about health and fitness and absolutely loves that her Arbonne business allows her to help people change their lives by changing their health from the inside out. She holds a Bachelor's Degree in Criminal Justice from California State University, Sacramento, a Master's Degree in Business Administration (MBA) from the University of Phoenix, and is a CrossFit Level 1 Trainer. When she's not working her full time job, working the businesses, and coaching/training in the gym, she loves outdoor activities, playing slo-pitch softball, and spending time with family and friends. Clifton was born and raised in a small town outside of Twin Falls, Idaho, where his father has run a window cleaning business for many years. He also grew up an athlete, enjoying all sports, but taking a special interest in basketball. He relocated to the Sacramento area in 2000 and has since worked in many capacities. He has many years of experience in both the customer service and labor industries and now has a deep understanding of what it means to excel at both. When he's not cleaning your windows, gutters, solar panels, or exterior of your home, he loves to spend time in the gym playing basketball and staying fit. He also loves to golf and enjoy the company of his friends and family. Clifton and April were married in 2008 while honeymooning in Playa Del Carmen, Mexico. They live in the Elk Grove area with their three young children, plus three fur babies. Around the same time they were married, Clif and April officially launched High Class Glass. They both work very hard to ensure their company reflects their character and deep desire to fulfill the needs of their customers. High Class Glass is owner-operated, licensed, and insured. 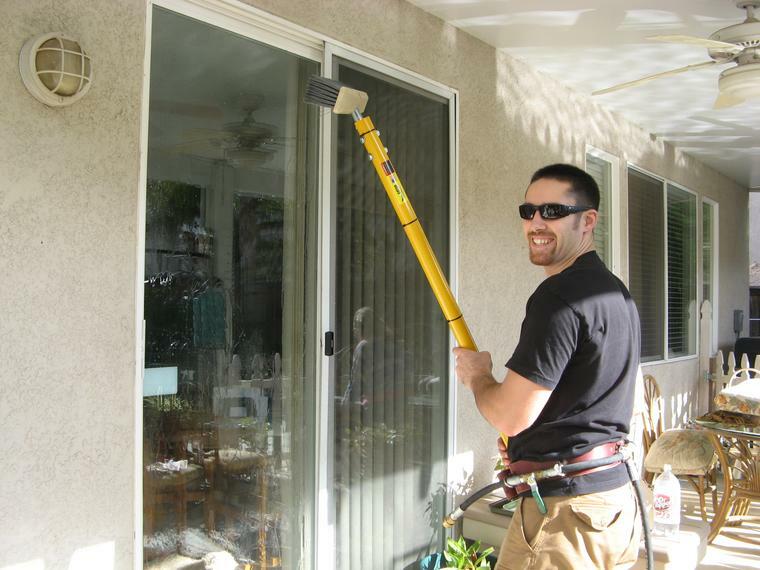 We pride ourselves on being unique to the window cleaning industry by offering a service combination no other local company does: a state-of-the-art cleaning system that makes harsh chemical cleaning agents unnecessary, mineral-free water that ensures ZERO build-up, streaks, and spots, completely flexible scheduling to work around the needs of the customer, much faster job completion than your typical window cleaner, a rewards and referral program, and a la carte pricing that allows the customer to pick and choose which services are needed and ultimately save money. One would think services like these would be more expensive than typical licensed window cleaners - not true. Over the years, we have been told countless times that our pricing is extremely competitive and the best value overall among our competitors. That said, we are always willing to match the written quote of a fully licensed and insured competitor.